Our Raw Organic Maca - Sundried products are made from Maca roots that are dried in the high Andes mountain sun for 10-40 days after harvest. This is the traditional way of processing Maca and makes for a sweeter and softer flavor. It also results in higher levels of “macaenes and “macamides,” nutrients unique to Maca and thought to be responsible for Maca’s hormone balancing activity. All of our Raw Maca products are never heated above 105F / 40C. This is important because research has shown that enzymes and other vital nutrients begin to break down at temperatures above 118F / 48C. Which Color? - Maca roots grow in a variety of colors that are grouped as Black, Red and Yellow. We offer Raw Maca in all of themhem all as well as a blend of the three. Black Maca - Best Maca for male fertility and libido, plus building muscle, increasing stamina, and improving memory and concentration for everyone. Red Maca – The highest in phytonutrients and tastes the sweetest. Especially good for prostate health, boosting energy, female fertility, menopause, female libido, and depression. Yellow Maca – The most researched Maca and the most prolific, it is a great all-around Maca. 3 Color Blend – The most traditional of all Maca. Used for 1000s of years. Less expensive. Sundried or Premium? - We offer both Sundried and Premium Raw Maca products. The difference between them is in how they are processed. Both get great results for our customers. if you'd like to learn more about Sundried vs. Premium Maca please click here. Sundried Maca Products – Our Sundried Maca products are made from Maca roots that are dried in the high mountain sun for 10-40 days after harvest. This is the traditional way of processing Maca and makes for a sweeter and softer flavor. It also results in slightly higher levels of "macaenes" and "macamides," nutrients thought to be responsible for Maca's hormone balancing activity. 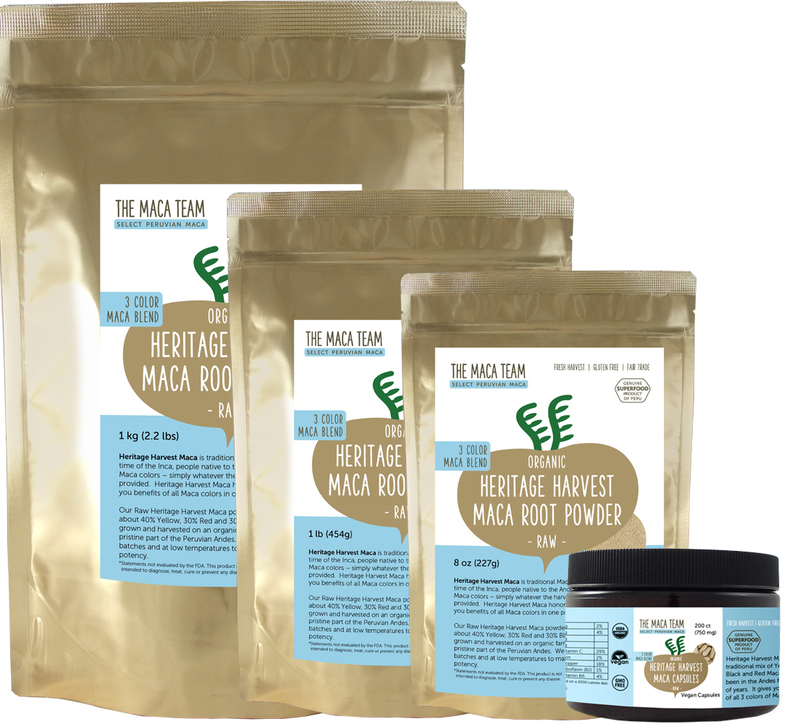 Premium Maca Products - Our Premium Maca products are made from Maca roots that are dried in dehydrators immediately after harvest. This modern approach to processing Maca was helps standardize nutrient levels and maximize glucosinolates (nutrients that may be associated with anti-cancer properties) content. Premium Maca powders have a stronger and spicier flavor. Powder, Capsules, Extracts or Chips? Maca Powders – Micro-powder allows for maximum nutrient absorption. Easy to use in recipes and economical. Maca Capsules – Contain only our Maca powder in Vegan Capsules. Convenient and perfect for those who don’t like the taste of Maca. Maca Extracts – Great tasting extracts of Maca in a vegetable glycerin base. Quickly absorbed and great to take with you on the go. Maca Chips - Closest to whole Maca roots, chips can be blended in smoothies, made into a traditional porridge, steeped as tea or even chewed. We recommend Raw Maca for anyone with a with average to strong digestion. For senstive stomachs we recommend Gelatinized Maca instead. You can find out which Maca we recommend for you on our Maca Comparison page. 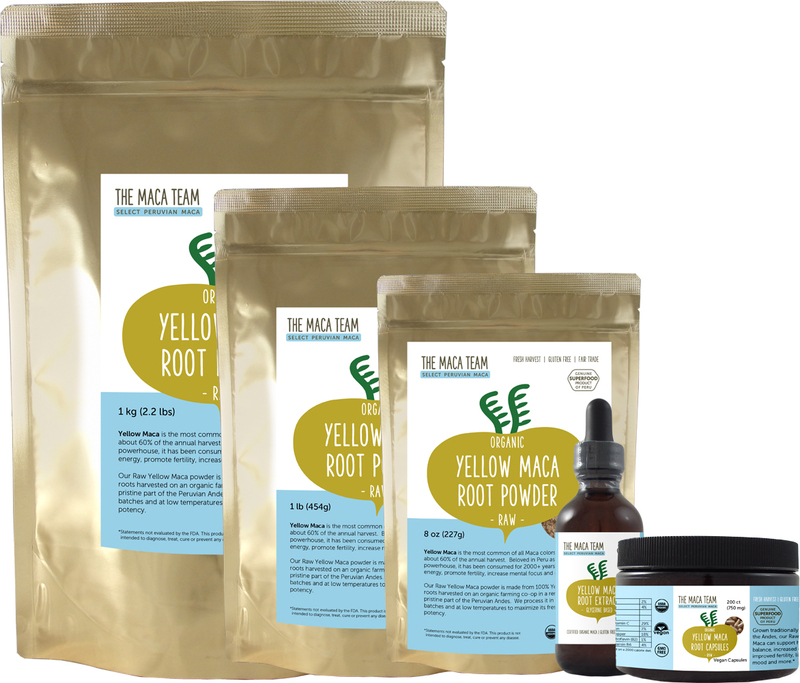 All Maca products we sell are carefully and consciously grown, processed and handled. They come from an organic farming cooperative in and around Junin, Peru. We work only with producers who own and manage their lands at a local grass roots level and who are committed to organic farming and to producing the highest quality Maca products available anywhere. Let us know if you have any questions. We're happy to help.